Engraver / Plate Maker: J. Merigot, 28 Haymarket, and R. Edwards, 142 New Bond St. This bridge, built over the Anio, or Teverone, is two miles from the Porta Salara. An inscription informs us that it was destroyed by Totila, and rebuilt by Narses, after his victory over the Goths. It was near this bridge, that Manlius in single combat slew a Gaul of gigantic stature; and taking from him a golden chain, obtained for himself and his family the surname of Torquatus. A view of the one end of the piece revealing the skillful application of the pattern. 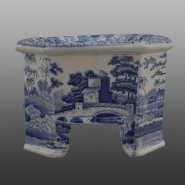 An earthenware dog bowl printed in blue in Spode's popular Tower pattern. The maker used the same border found in the pottery's Milkmaid pattern. Tower was used not only on table wares but on a number of different utility shapes as well. Its popularity and production lasted well into the twentieth century. Continuing interest in the pattern is reflected in twenty-first century reproductions.